Soppong, a place to discover the simple joys in life. After Pai, our next stop on the Mae Hong Son loop was Soppong, a quiet village where nothing much seems to happen. Yet it is often in places like this where one has the more unexpected adventures. It all started innocently enough, when we stopped for lunch at a local joint. A simple jok, i.e. Thai congee (savoury rice porridge) hit the spot. 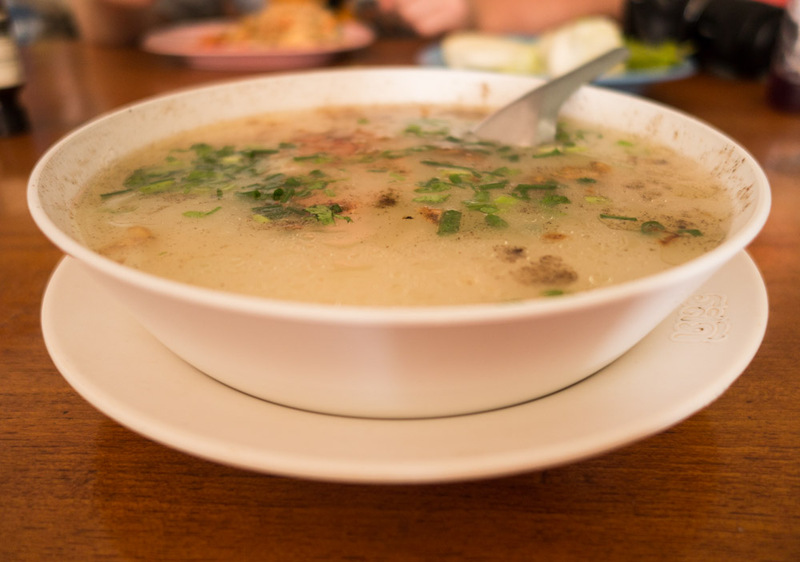 A big bowl of jok in Soppong. It is our order of a larb dish (a meat salad) where it started to get more interesting. Simon and I love a good larb, so when we saw the word "larb" on the menu we just went for it. I think this was a larb moo of some sort - that is, a pork larb. But this was a larb like no other we've ever had. 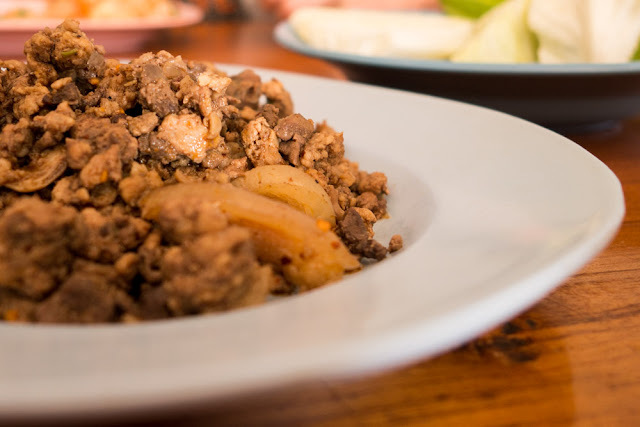 As it turned out, the style of larb that we are accustomed to is the Laos and Isaan version. This, however, is the Northern Thai version, and it is so different that it was almost a shock to our senses. Pungent, in a bloody, intestinal sort of way. Now, don't get me wrong - I like a few blood cubes in my curry laksa, and I absolutely adore intestines in my bak kut teh. But I'm not generally a fan of blood sausage, and this was kind of like stir-fried blood sausage. It was the only dish we had in Thailand that we just couldn't bring ourselves to finish. Yet we didn't want anyone to feel bad. To my delight, I realised that I had a plastic bag (probably the same one that the van driver gave us for the ride from Chiang Mai to Pai, which I thankfully didn't have to use). As stealthily as possible, I tipped the larb into the bag, and then we fed it to a stray dog we found outside, who appreciated it more than we did. Crisis averted! After lunch, we found a scooter hire place and away we went. The owner of Soppong River Inn, where we were staying, gave us a photocopied hand-drawn map, which included the locations of various hilltribe villages, so that gave us plenty of fodder for exploratory adventures. We said hello to pigs. And we said hello to chickens. The chickens had no tails, and I found this to be utterly charming. Does anyone know what breed of chicken this is? 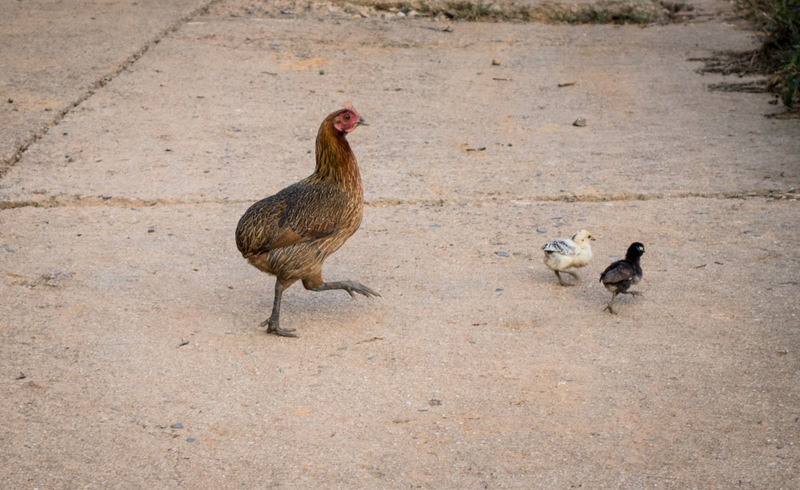 A rumpless hen and her chicks. We took it easy that evening (not that there is much to do at night in Soppong). Soppong River Inn has a restaurant and bar called Seven Elephants Cafe. Here, we cleansed ourselves with our favourite Isaan-style larb (no surprises this time! ), a red curry, and Shan meatballs, which were all very tasty. In case you were wondering about the relevance of the Shan meatballs - apparently Soppong is not only home to many hill tribes, but also has a sizable Burmese Shan population. 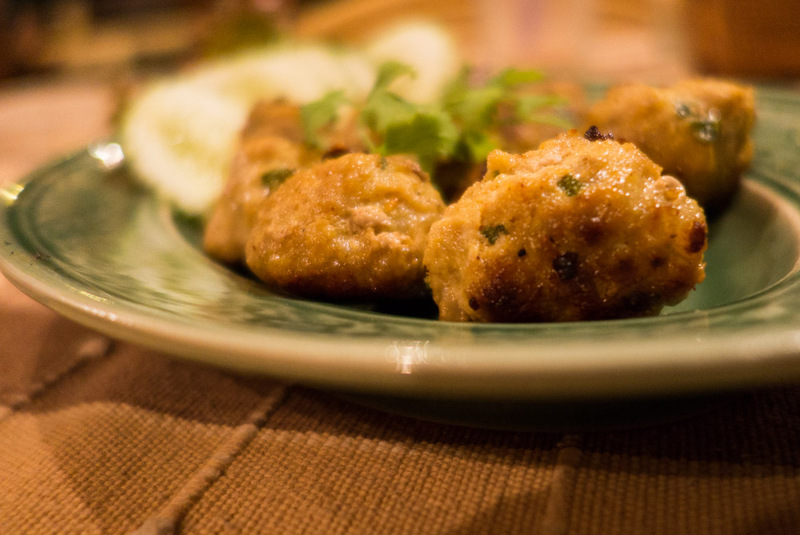 Shan meatballs at Seven Elephants Cafe, Soppong River Inn. And oh, hi! 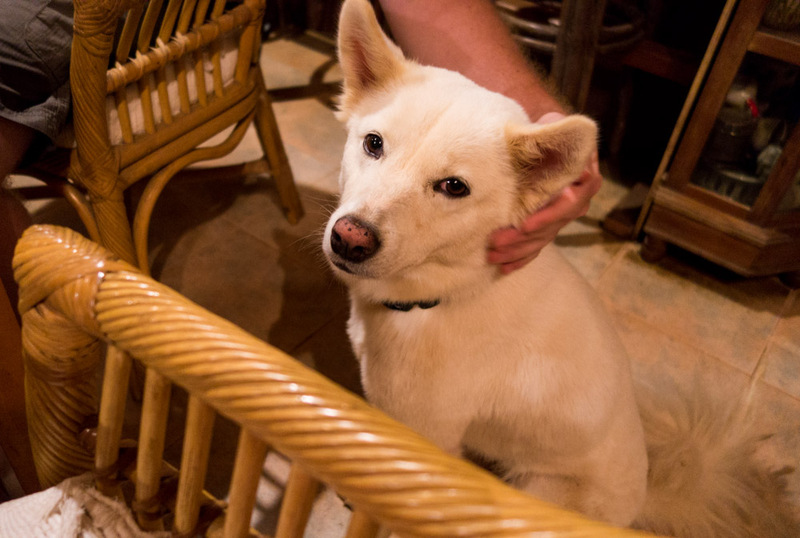 The inn's resident dog happens to be adorable. Soppong River Inn's sweet doglet. Despite having had a decent time at Soppong River Inn, we switched to a cheaper room at the nearby Lemon Hill Guesthouse the following day in a bid to further stretch our cash reserves. It is more basic, but still perfectly practical for our simple needs. We continued to explore Soppong. 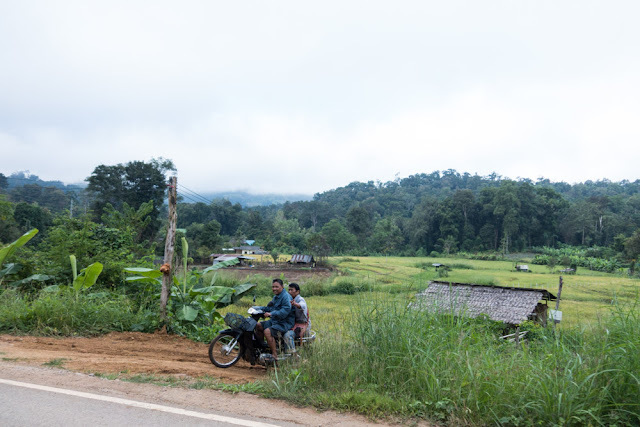 It is quite a hilly region, with not-always-very-well-maintained winding roads, which can be quite steep as well as riddled with potholes in some parts - quite the perilous combination! Therefore, if you are interested in exploring Soppong on a motorbike or scooter with a passenger, may I suggest that you get a reasonably powerful vehicle? Case in point - our poor little scooter had trouble carrying the both of us up this path. I had to get off and walk, so that Simon can drive it up! This scenario played out several times. The struggle is real. At least I got a pretty cool picture out of this whole debacle, even though we failed to get up to the very top of the hill in this instance - that path just got steeper and steeper, and we had to admit defeat. I still wonder what was up there! 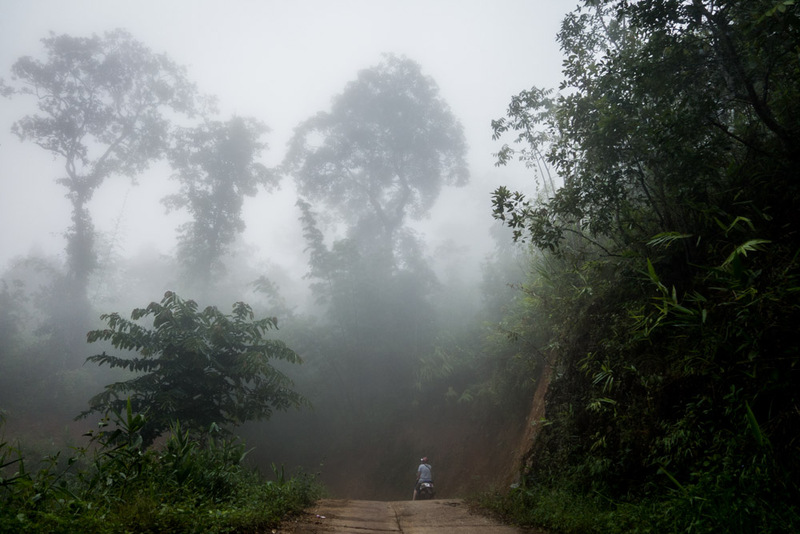 A misty morning in Soppong. So off to the shops we went, to buy new sandals for Simon. I didn't bother taking a picture of his new footwear. Why, when I can take pictures of kittens play-fighting instead? Play-fighting kittens. Such cute little bundles of energy! After spending quality time with the cats, we cleaned up so we can try the food at the market adjacent to the shops. Top tip: hand sanitizer is a wonderful thing when your travels mostly consist of patting cats and eating street food. The deep-fried snacks at this stall greatly intrigued us. 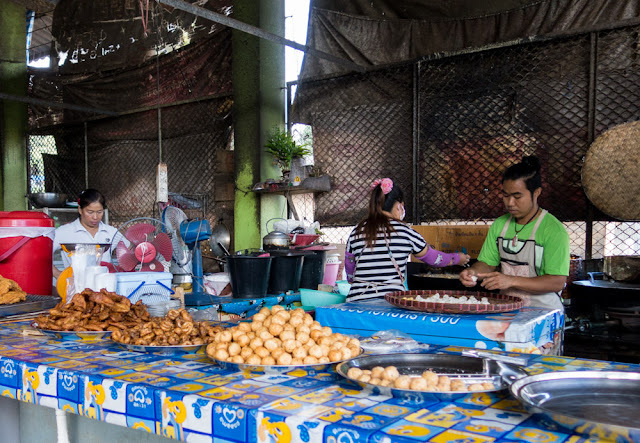 Market stall with deep-fried delights. We purchased what appeared to be deep-fried doughnut balls that are casually dotted with black sesame seeds on the exterior. They were only 1 baht each! They were quite petite, but still awesome value. We bought a dozen. Six from one tray, six from another, to suss out the differences. Language barriers meant that it was often almost impossible to know exactly what we were buying in Soppong - kind of a "don't try, don't know" situation. 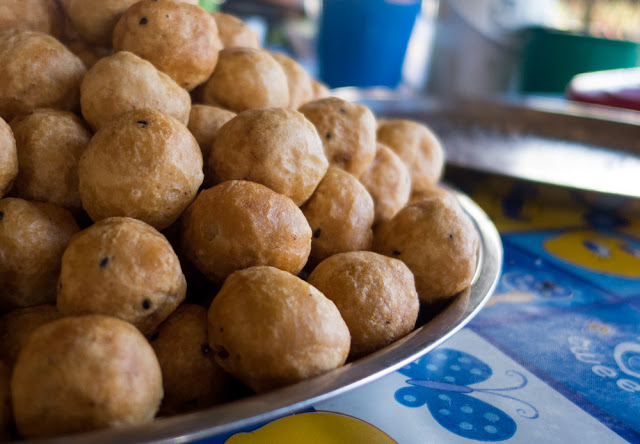 Deep-fried balls at Soppong market. Nom noms. Anyway, this one had what I think is a mung bean filling. It was so delicious. 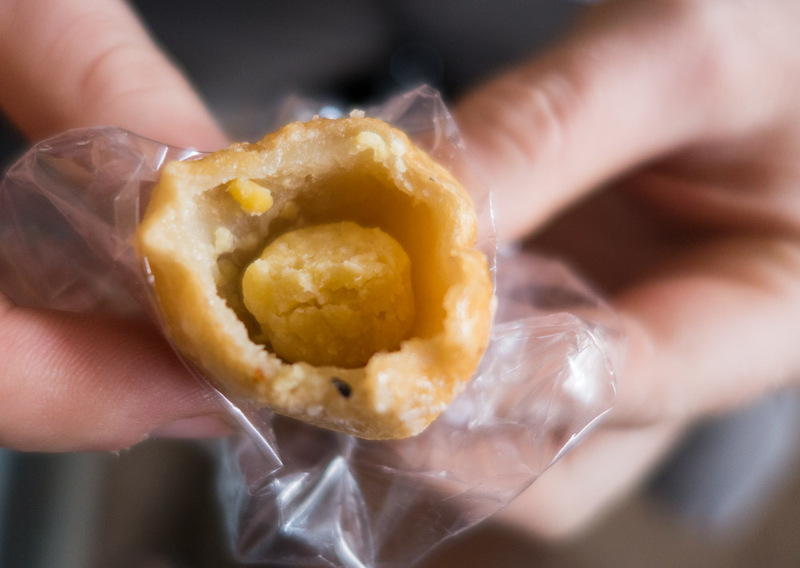 Deep-fried doughnut with mung bean filling. While this one had what was clearly a shredded coconut filling. Also very scrumptious. 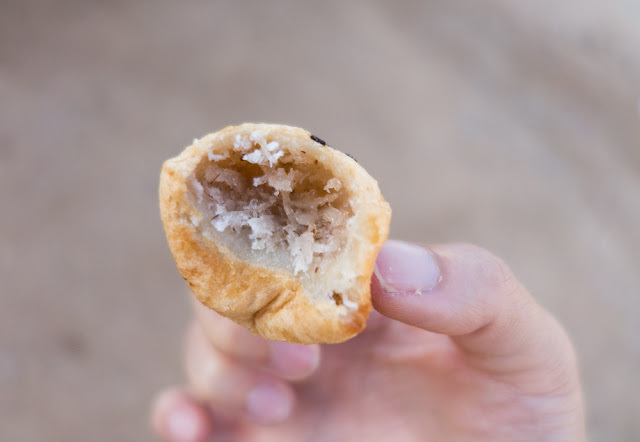 Deep-fried doughnut with shredded coconut filling. Then, I got my savoury breakfast fix at another stall - a comforting noodle soup with meatballs, chinese cabbage, coriander leaves and a touch of pepper for 20 baht. Noodle soup at Soppong market. 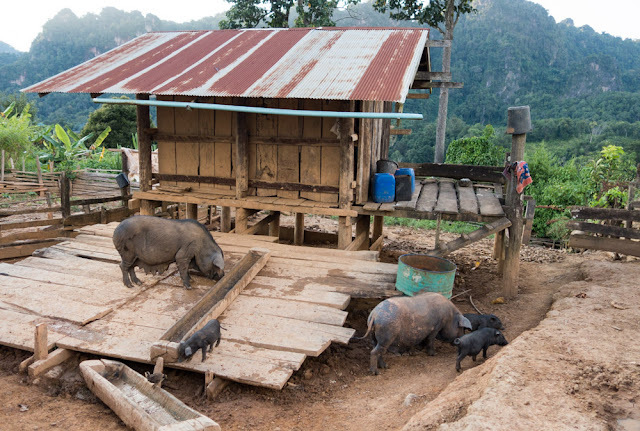 We continued to check out the hill tribe villages of Soppong. 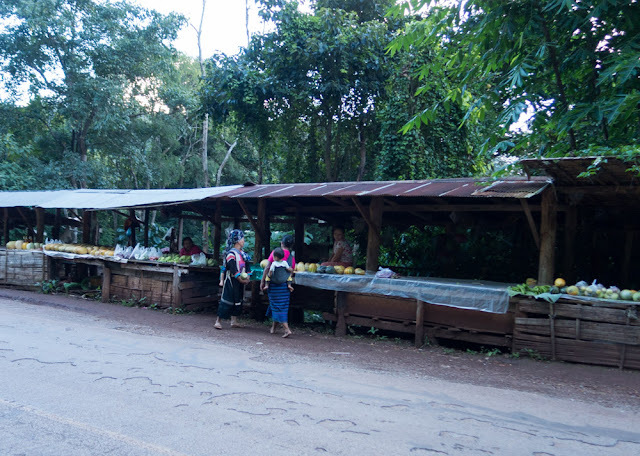 A hill tribe market - precariously located by the side of a main road. One doesn't have to venture too far to observe the nice green scenery in these parts. Lovely scenery in the hills of Soppong. I don't think the little hill tribe villages in Soppong get foreign visitors very often. The children, in particular, appeared to be profoundly amused by our presence, with their shouts and giggles. We also stumbled upon an impromptu cockfight! It was so much fun to watch. 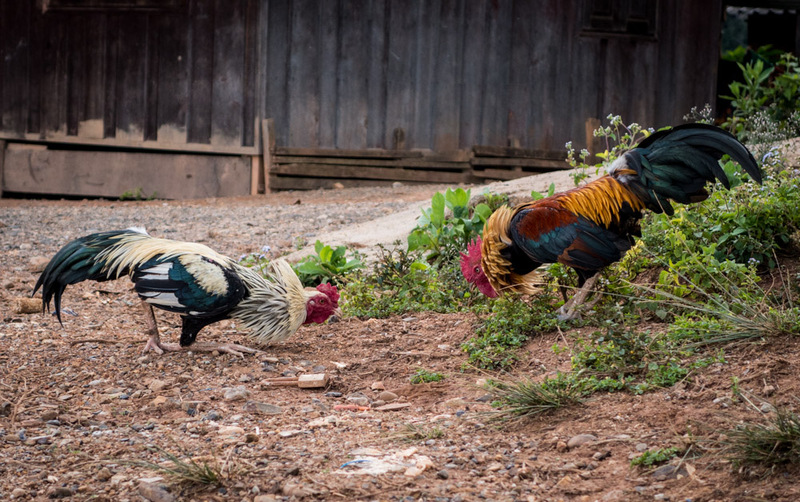 Hilariously, a third rooster came along eventually, and broke up the fight. What a hero. Cockfight! Or rooster fight, if you prefer an alternative term. In the central area of Soppong, we had lunch at a street stall. 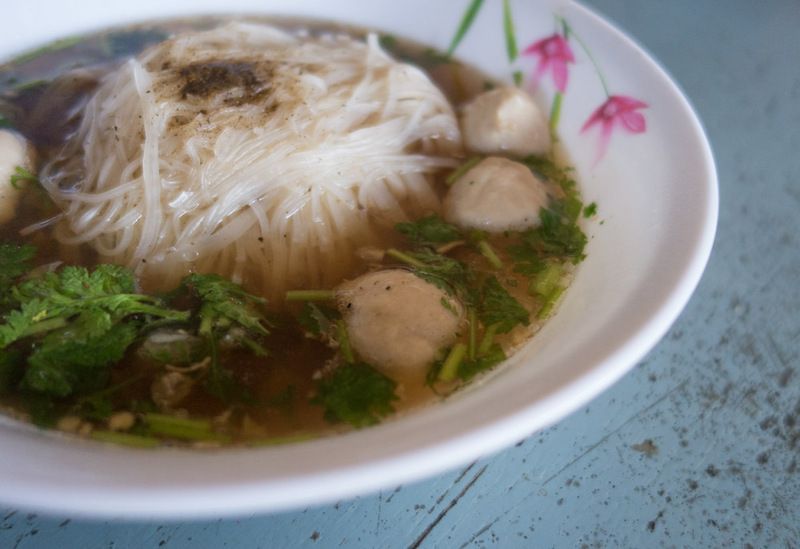 The lady here serves simple and affordable noodle soups for 30 baht each. Noodle soup with chicken in a spicy broth. 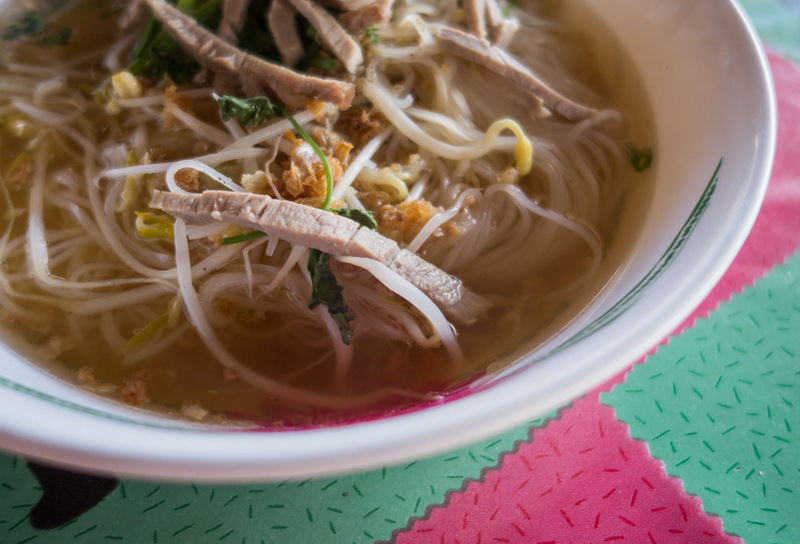 Noodle soup with sliced pork and beansprouts in a clear broth. On our second evening in Soppong, we tried to find the Jungle House restaurant after reading somewhere that it served good food. After stumbling around for what felt like way too long in the dark we got there, only to be told that the restaurant was not open that night. Fortunately, we found a random food shack nearby. It seems that I didn't learn my lesson after the initial larb incident, and I daringly pointed at some mystery meat dish, which looked like an offal stew with rolled rice noodles. It wasn't fabulous (to me, anyway; I'm beginning to think that perhaps I'm fussier about the preparation of offal than I imagined), but at least with this one I managed to finish most of it, albeit somewhat reluctantly. 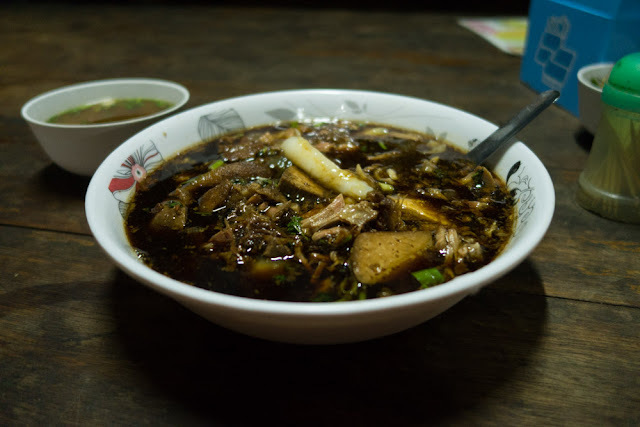 A rich dark offal soup with curled-up rice noodles. Simon was smart and played it safe. 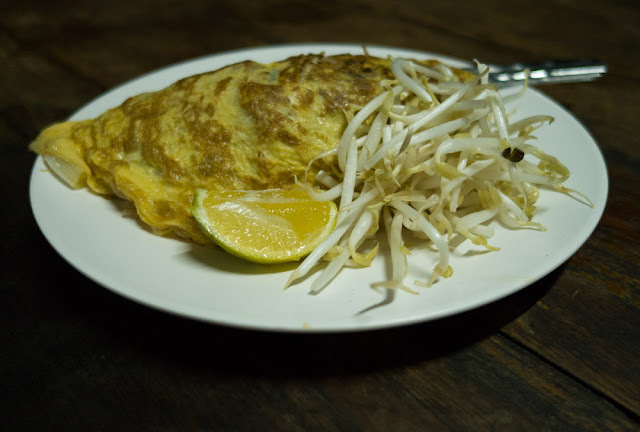 He ordered a pad thai, and to his delight, he received a pad thai that was artfully encased in an omelette. I had a serious case of food envy. Pad thai in an omelette! 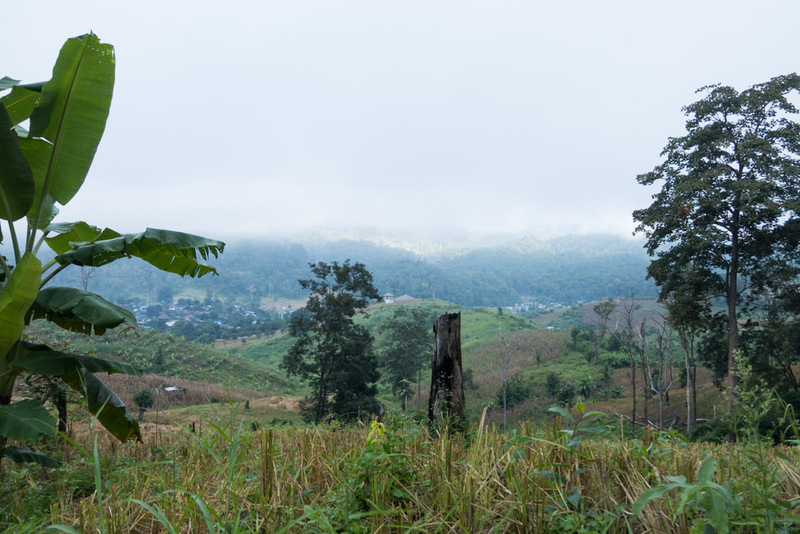 The next morning, we visited the main attraction of Soppong - Tham Lod (also spelled Tham Lot). 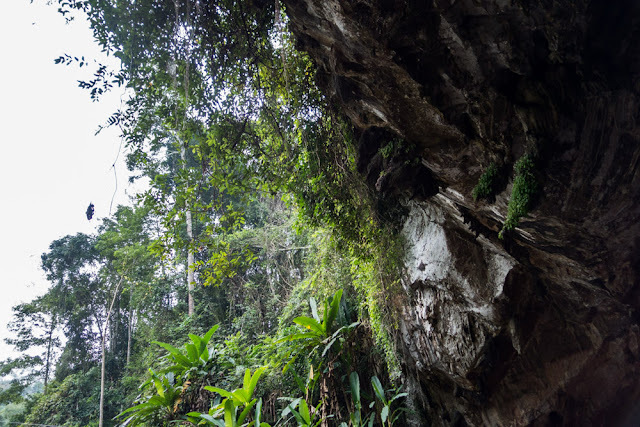 It is often referred to as Tham Lod cave, but that's superfluous, kind of like saying ATM machine when ATM already stands for automated teller machine. "Tham" is Thai for "cave" and "Lot" is Thai for "through", so really it's just Tham Lod, or Lod Cave, or Through Cave, I guess. Oh, and we didn't see any ATMs while we were in Soppong, by the way. Good thing we had cash! We got to Tham Lod too early, and the guides and boatmen weren't available yet, so we just wandered around and did some very superficial spelunking. Tham Lod from the outside. Then we went back to the tourist entrance area again. A shop was open, so we ate! 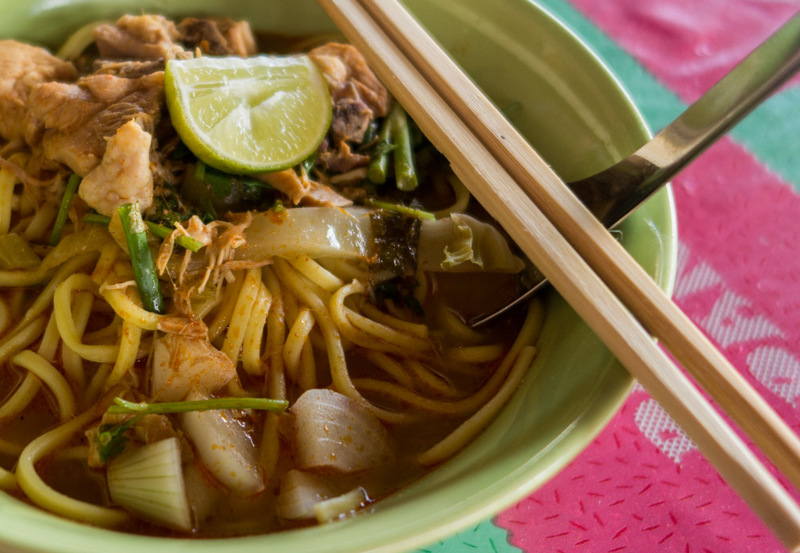 Khao soi for breakfast is a marvelous thing. Supple egg noodles in a curry sauce, with meat (the ones we got during our North Thailand trip typically came with chicken). It is also often topped with crispy deep-fried egg noodles. I approve of that. 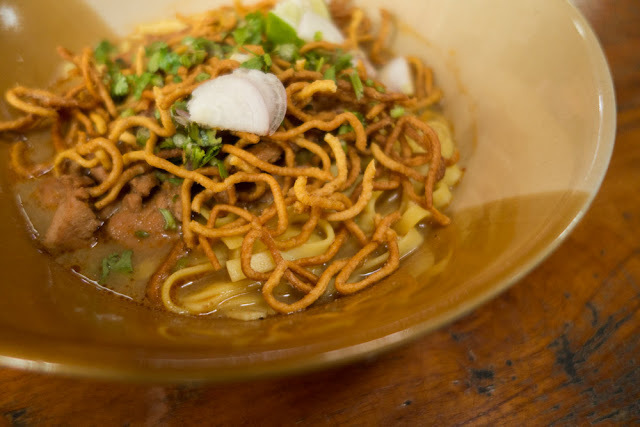 Northern Thai khao soi with crunchy noodles! Oh, and if khao soi for breakfast is marvelous, then khao soi with Thai iced tea is even better. The two go together so well. 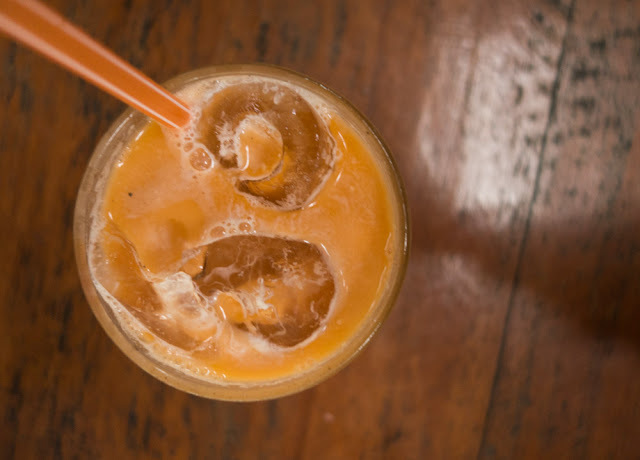 Thai tea with ice: a refreshing pick-me-up! After our breakfast, we were finally able to score a guide and a boatman. Thus the cave exploration begins. We were here in late October, right at the cusp of the wet and dry seasons. 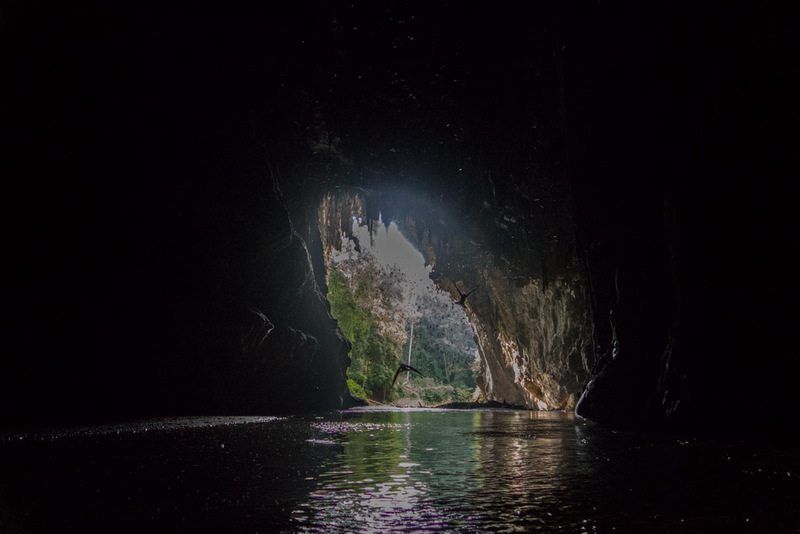 To get from one walkable section of the cave to another, a raft was compulsory. At some spots, the water levels were too shallow to row, so our boatman had to get off and pull us along. 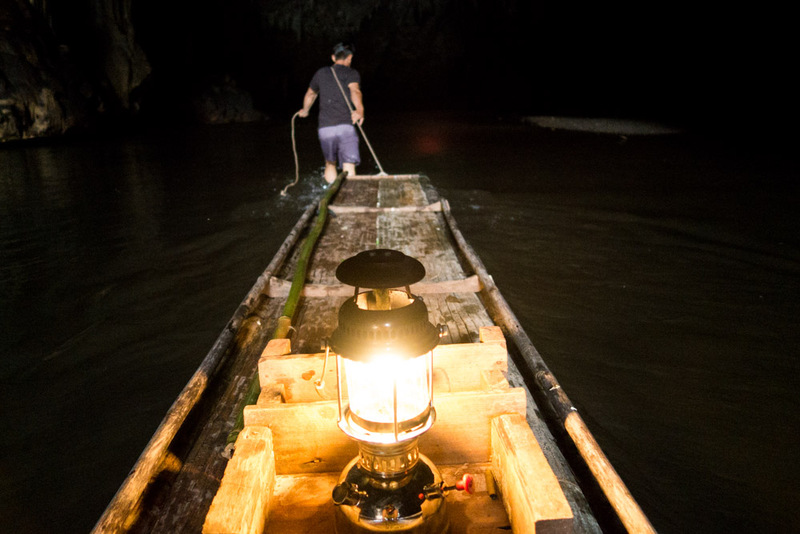 Elsewhere, the waters were adequately deep, and our guide encouraged us to sprinkle fish food into the darkness and watch as the hungry fish swarmed to get their share! Navigating the waters of Tham Lod. The cave is home to hundreds of thousands of bats and swifts. Needless to say, some parts of the ground area was covered with droppings, complete with a choking, suffocating smell. It was impossible to avoid walking on it, and you had to be careful not to slip on it! The intrepid side of me accepted this undesirable poo situation as all part of the experience, while the precious side of me just wanted to scuttle back to the raft. The curious side of me did the walk because I wanted to see the ancient teakwood coffins. The coffins turned out to be surprisingly small. I'm not sure about the logistics of it all. I have to admit, seeing the bats and swifts fly in and out of the cave was pretty nifty. I think we saw more swifts than bats, and that suited me just fine. Swifts flying in and out of Tham Lod. 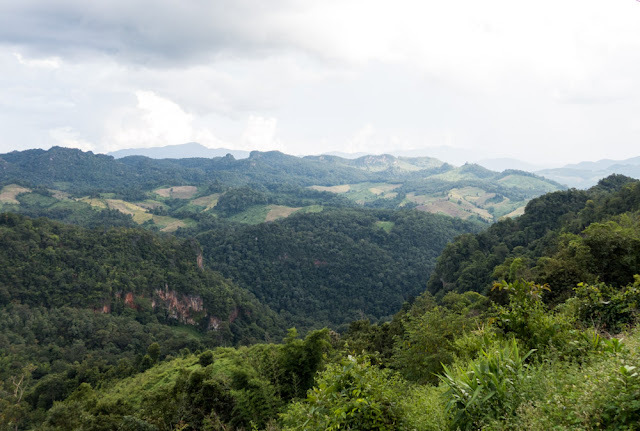 After our trip to Tham Lod, we returned to our guesthouse, took a shower, washed our shoes as thoroughly as we could, and then we caught a bus to our next destination, Mae Hong Son town. Bye bye, Soppong. It's been quite fascinating getting to know you! Nice hill views in Soppong. Ah I love your travel series :) I really relate to the way you explore a country and its food. Just reading this feels like I'm there :) Ahhh that congee would hit the spot. 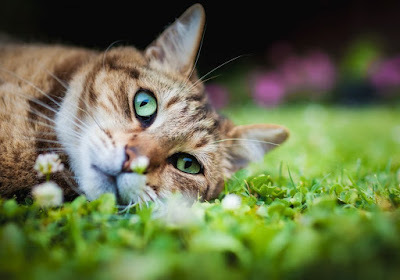 Loving all the animal pics as well, especially the kitties. What an adventure you had. It's the first time I've seen a chicken without a tail and the doglet in the in looked so adorable. As for the food, the filled little donuts looks really interesting. 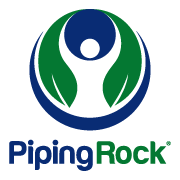 What kind of dough was used, was it like a sticky rice base? It was a fun adventure, indeed! I'm not sure about the doughnut dough, but it could potentially be made from sticky rice flour. It does look similar to the Vietnamese banh cam, doesn't it!